Самолет S.71, впервые взлетевший в 1930 году, представлял собой трехмоторный свободнонесущий высокоплан смешанной конструкции, с закрытой кабиной и шасси с хвостовым колесом. Самолет был рассчитан на перевозку восьми пассажиров и четырех членов экипажа. Первые ДальшеMore>>> четыре S.71 были оснащены радиальными ПД Walter Castor, но остальные три самолета получили 370-сильные (276 кВт) ПД Piaggio P.VII. Обычно S.71 оснащались обтекателями на основных стойках шасси, обтекателем хвостового колеса являлся наплыв на фюзеляже. Основным оператором самолета была итальянская "Societa Aerea Mediterranea" (SAM), выполнявшая рейсы между Римом и Бриндизи, а позднее вдоль побережья Адриатики до Албании. S.71 также эксплуатировались национальным авиаперевозчиком "Ala Littoria", образованным в 1934 году путем слияния компаний SAM, SANA и SISA. Самолет S.72, отличавшийся от S.71 увеличенными размерами и усиленной конструкцией, создавался в качестве тяжелого бомбардировщика. Прототип (гражданская регистрация - I-ABMO, военный серийный номер - MM 219) взлетел в 1934 году, и хотя не был принят на вооружение ВВС, сначала использовался в качестве VIP-транспорта, совершая рейсы в итальянские колонии. Летом 1935 года машину продемонстрировали в Китае, а затем подарили ее генералиссимусу Чанкайши. Китайцы заказали шесть серийных S.72, но они должны были собираться в Китае. Вероятно, большая часть из них была уничтожена во время японских налетов в конце 1937 года. THE high-wing cantilever monoplane, of the type introduced some time back by the Fokker Company, has gained considerable popularity in many countries of late, especially multi-engined models. Just recently the well-known Italian aircraft firm of Savoia-Marchetti has produced a commercial machine oа this type in the "S-71," of which we are able to give below some brief particulars. The "S-71" is a medium-powered machine intended for air lines having fairly big traffic. It is claimed that this type of machine, together with its individual features and aerodynamic qualities, presents something entirely different to other machines at present in use for mail and passenger service in Italy. As will be seen from the accompanying illustrations, the "S-71" has a fairly thick cantilever wing, tapering in chord and thickness from root to tip, mounted on top of the fuselage, and is equipped with three engines, one mounted in the nose of the fuselage and two mounted on the wings, on either side of the fuselage. The wings, which are similar to those used on the “S-55" seaplane and the "S-64 bis" monoplane, which established a world's record for duration and distance in a closed circuit, are constructed entirely of wood, having three box spars and three-ply covering. Four duralumin petrol tanks are mounted inside the wings. Welded steel tubing is employed for the construction of the fuselage, and the central engine mounting - which we believe is detachable - enables different types of engine to be installed. Immediately behind is the pilot's cockpit, at the leading edge of the wing. Dual control is provided, with side-by-side seats, and the cockpit is completely enclosed by glass windows, the whole merging neatly into the streamline of the fuselage and wings. The passengers' cabin comes immediately behind and below the pilot's cockpit; it has a capacity of 424 cu. ft, and accommodates eight passengers with the maximum of freedom and comfort - the height of the cabin being 6 ft. Comfortable armchair seats are arranged on each side of the cabin, with a central gangway between, and sliding glass windows extending continuously the full length of the cabin provide an excellent view below. It is claimed that these windows, when open, are sufficiently large to enable the passengers, if need be, to jump therefrom with their parachutes. At the rear of the cabin are a lavatory and the luggage compartment. A large door on the left-hand side of the fuselage, just at the rear of the cabin, provides easy entrance and exit. The tail surfaces are of the monoplane type, the horizontal stabiliser being adjustable as to incidence during flight, while the vertical fin can also be adjusted when on the ground. These tail surfaces are all constructed of wood, with three-ply covering. The elevators and rudder have horn balances, as have also the ailerons. The landing gear is of the non-axle type, the wheels being hinged to the fuselage by steel V-members, landing shocks being taken by Oleo-pneumatic struts extending up from the wheels to the wing-engine mounts. Oleo-pneumatic brakes, with differential control, are provided. A strong tailskid, suitably sprung, is fitted. As previously stated, the power plant consists of three engines, one mounted in the nose of the fuselage, and the others on the wings. These latter engines are carried in steel mountings, slung from the front wing spars, neatly faired into the wing by metal cowlings. The engines installed in the machine illustrated are 240 h.p. Walter "Castor" air-cooled radials, equipped with two-bladed adjustable metal air screws. Starting is by compressed air, with Garelli motor-compressor. The following performance figures for the "S-71" have been issued. With two wing engines in action and a full load of 3,748.5 lb., the machine takes off in 30 sec. in a run of 416 yards, climbs to 3,281 ft. in 10 min., to 6,500 ft. in 22 min., and to 9,800 ft. in 51 min., and has a maximum horizontal speed of 130.5 m.p.h. With one engine in action and 2,205 lb. load, the machine will maintain level flight, or with full load with a drop of 4 per cent. One of these monoplanes recently flew from Milan to Rome in 2 hr. 45 min., and, piloted by Alessandro Passaleva, established an altitude record, with 2,000 kg. load of 6,540 m. (21,457.7 ft.). The principal characteristics of the Savoia ''S-71'' are: Span, 69 ft. 6 in. (21.2 m.); overall length, 45 ft. (14 m.); height, 13 ft. 6 in. (4.1 m.); wing area, 645.6 sq. ft. (60 sq. m.); weight empty, 6,174 lb. (2,800 kg. ); weight laden, 9,922 lb. (4,500 kg. ); pay load, 1,874.25 lb. (850 kg. ); speed range, 62-146 m.p.h. (100-235 k.p.h. ); cruising speed, 124 m.p.h. (200 k.p.h. ); climb, to 3,281 ft. (1,000 m.), 3 min. ; to 9,800 ft. (3,000 m.), 14 min. ; to 19,686 ft. (6,000 m.), 54 min. ; duration, 8 hours. Three-quarter front view of the prototype Savoia Marchetti S.71, I-AAYP, commercial monoplane fitted with three 240 h.p. Walter "Castor" engines and accommodating eight passengers. It first appeared in 1930. The Savoia Marchetti S.71, a three-engined transport aircraft accommodating a crew of three and eight to ten passengers, made its maiden flight in 1930. This particular example, I-AAYP, was powered by three 240 h.p. Walter Castor air-cooled radial engines which gave it a cruising speed of 111 m.p.h., and was one of six S.71s used by the Italian Societa Aerea Mediterranea, originally operating on their Rome - Brindisi service and later flying the entire Rome - Salonica route. Итальянская авиакомпания SAM использовала шесть S.71, включая прототип I-AAYP (на снимке). У самолета отсутствуют обтекатели, обычно устанавливавшиеся на основных стойках шасси. The S.72 I-ABMO, in modified form, at Bangkok. The aircraft had accommodation for three crew and six passengers. Создававшийся как военный вариант самолета S.71, S.72 был крупнее предшественника, но не вызвал интереса у итальянских военных. 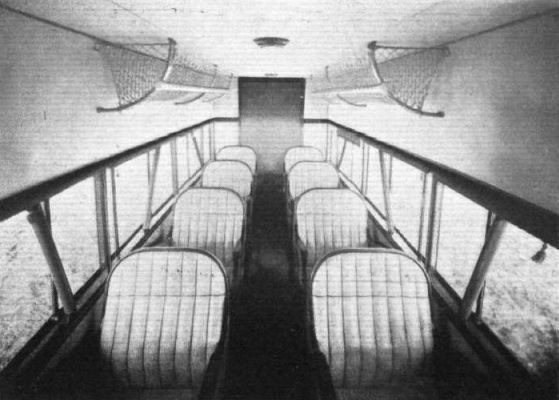 An interior view of the cabin of the Savoia-Marchetti "S 71."